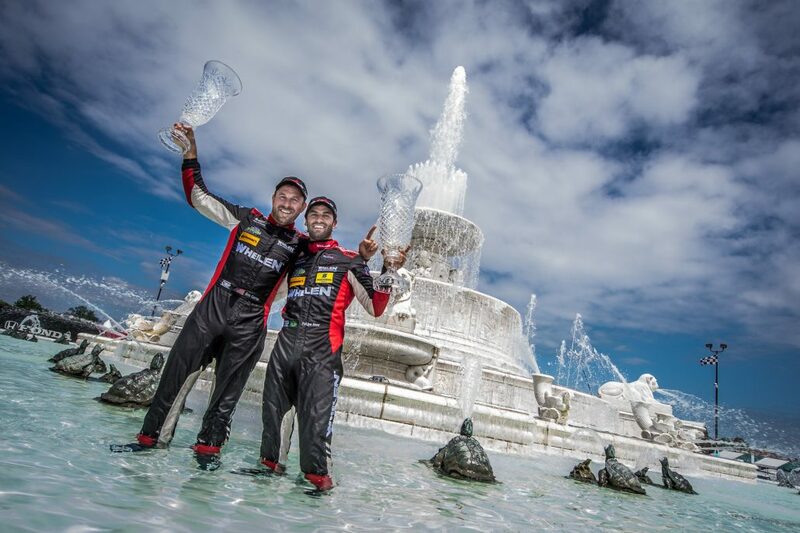 Detroit, Mich. (2 June 2018) Whelen Engineering Racing used teamwork, strategy, and great race pace to score its first victory of the 2018 IMSA WeatherTech SportsCar Championship season on Saturday in the Chevrolet Dealers Grand Prix in Detroit. This was Whelen Engineering Racing’s second victory in three years at Belle Isle comes on Sonny Whelen’s Birthday! Drivers Eric Curran and Felipe Nasr, (Sunoco Whelen Winner 2012), shared the driving duties in the No. 31 Whelen Engineering Racing DPi-V.R to capture their third podium finish of the 2018 season. The post-race celebrations, which included a jump into the Victory Circle fountain for both drivers, were further boosted by the fact that the race victory came on the birthday of long-time motorsport and Team Fox supporter Sonny Whelen. A crash in Friday’s practice session could have set the team effort back, but instead the group rallied to make repairs in time for qualifying. Curran started the race from sixth in the order and was able to move to run in fifth before taking to the pit lane for a stop for fuel and a driver change. Nasr returned to the field 18th in the order but worked his way forward to the top five by lap 38. A final fuel-only pit stop on lap 39 set the stage for Nasr’s run to the front as he claimed the lead on lap 44 and refused to relinquish the point to score a big win for the team. The next race on the IMSA WeatherTech SportsCar Championship will be the Sahlen’s Six Hour at Watkins Glen International on July 1.